Supporters of a Montreal man on a UN terror watchlist say the federal government is creating further confusion about his already complicated legal status. 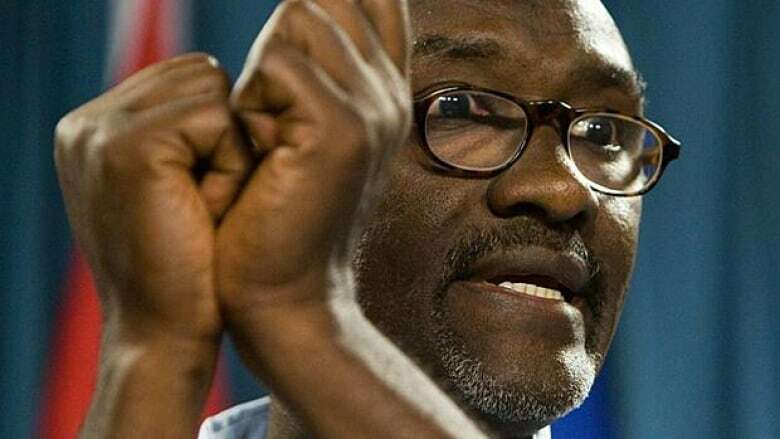 Abousfian Abdelrazik lives under strict restrictions because his name appears on the blacklist, despite having been cleared by both Canadian and Sudanese authorities of any wrongdoing. Earlier this year, the Quebec government told the Sudanese-born Canadian he couldn't receive child-assistance benefits because he was on the list and would need an exemption from the foreign affairs minister. Now Ottawa's reply has perplexed Abdelrazik's lawyer. It suggests federal intervention is unnecessary. "It is the opinion of the Department of Foreign Affairs that such a certificate is not required, as the regulations do not prevent persons from making deposits into Mr. Abdelrazik's account, so long as it remains frozen," the department wrote in a letter dated July 6. The letter notes that Abdelrazik is limited in how much he can withdraw each month from the account — $2,000 according to a previous certificate. Abdelrazik's lawyer, Khalid Elgazzar, said Ottawa's interpretation only creates confusion when it comes to his client's already complicated situation, particularly since his name remains on the list. "This only serves to muddy the waters," Elgazzar said in a phone interview from Ottawa. "It's difficult to say now what he is and isn't entitled to, based on this new certificate we received from the minister of foreign affairs." A Foreign Affairs spokesperson said by email that the department was looking into the matter. Abdelrazik spent six years in forced exile in Sudan, some of the time in prison where he says he was tortured. Despite being exonerated, he remains on the UN Security Council's 1267 list, where his name has been since 2006. The UN sanctions clearly state that someone on the list is subject to an asset freeze and travel ban. It is also illegal for anyone to provide him with financial assistance or pay him for work. It remains to be seen if the Quebec government will go along with Ottawa's interpretation. "If Mr. Abdelrazik receives the payments, that's one thing," said Elgazzar. "If he doesn't, and the [Quebec government] disagrees with the federal government's interpretation, then we'll have to take that up with the federal government or other avenues that are available." Abdelrazik has taken steps to have his name stricken from the list. Last month, a delegation of his supporters went to United Nations headquarters to appeal on his behalf — their second such attempt. "I am an innocent person, I did nothing wrong, I am not a member of al-Qaeda and I'm not a member of Taliban," the single father said during a recent news conference. But getting a name stricken off the blacklist is rare. "We'll wait and see on that front. Otherwise Mr. Abdelrazik's other legal challenges continue," Elgazzar said. Abdelrazik is also suing the Canadian government for $27 million for warning Sudanese authorities about him and preventing him from returning to Canada. He was finally cleared to return to Canada in 2009.